So easy, yet so good! This simple snack is made with just two ingredients . . . almond bark and Golden Grahams. Everyone will love it and you will love how easy it is to make. 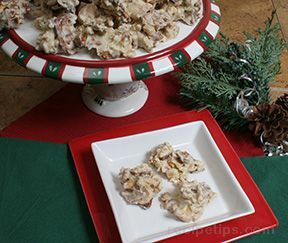 A yummy snack to serve for Christmas, Easter, Birthdays or any special occasion. 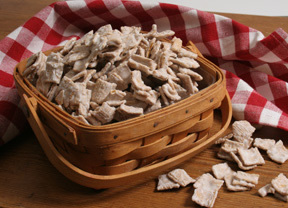 Place the almond bark in a large microwave-safe bowl. Heat in the microwave on high for 1 minute; take out and stir. Heat again at 30 second intervals until the almond bark is completely melted; stir after each. 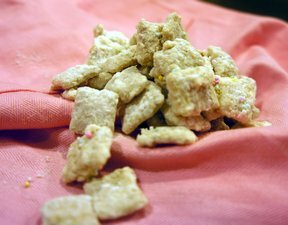 Pour in the Golden Grahams and stir until the cereal is evenly coated with the almond bark. Pour the mixture out onto a surfaced lined with wax paper. 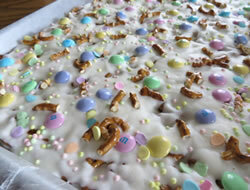 Spread the almond bark coated cereal out on the wax paper, separating as much as possible. Allow the mixture to set until the almond bark has hardened completely. Note: If you like the cereal to have a little thicker coating do not add the entire box of cereal. Start by adding all but 1 or 2 cups and then determine if you want to add the remaining cereal. "These are so yummy! Only one problem . . . you won't be able to stop eating them. My kids loved this snack. I made it for card club and it was all gone at the end of the night. You will love it and it is so simple to make."